This is a great recipe, definitely one of my favorites. This is adapted from Blue Eggs and Yellow Tomatoes by Jeanne Kelley. In a baking dish, big enough to hold the pork chops in a single layer, stir 2 cups water, the salt and allspice together until the salt is dissolved. Submerge the pork chops and refrigerate overnight. Heat a large skillet over medium heat with the butter or oil. Add the apples and saute until golden and just tender, about 10 minutes. Transfer the apples to a platter and cover to keep warm. Drain the pork chops and pat them dry. Season with fresh pepper and add to the same skillet, cook until well browned on both sides but slightly undercooked. Transfer to the same plate as the apples. To the same skillet add the shallots and sage and cook until the shallots soften, about 1 minute. Add the apple cider and bring to a boil. Boil until the mixture is slightly reduced, about 8-10 minutes. Add the apples and pork back to the skillet and cook unti pork is done. 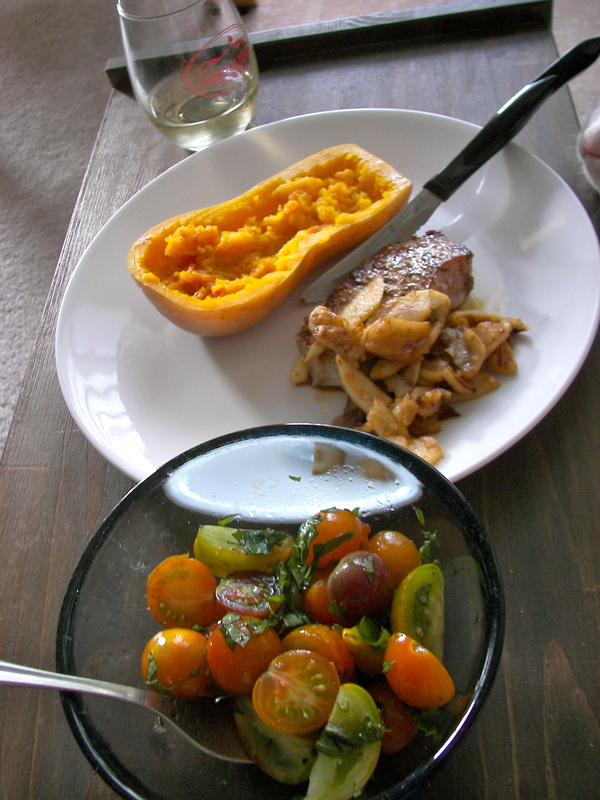 I served this with sautéed cabbage and baked winter squash. Preheat oven to 425°. Combine first 5 ingredients in a small bowl. Rub garlic over surface of trimmed pork loin. Heat a large skillet over medium-high heat (with a little olive oil). Add pork and onion; cook 10 minutes or until browned on all sides, turning occasionally. Place the pork in a roasting pan with olive oil smeared around. Sprinkle the sugar mixture over roast. Arrange the onion around pork, and drizzle with vinegar. Bake at 425° for 20 minutes. Melt butter in a large skillet over medium-high heat; add apples, and sauté 5 minutes or until golden. 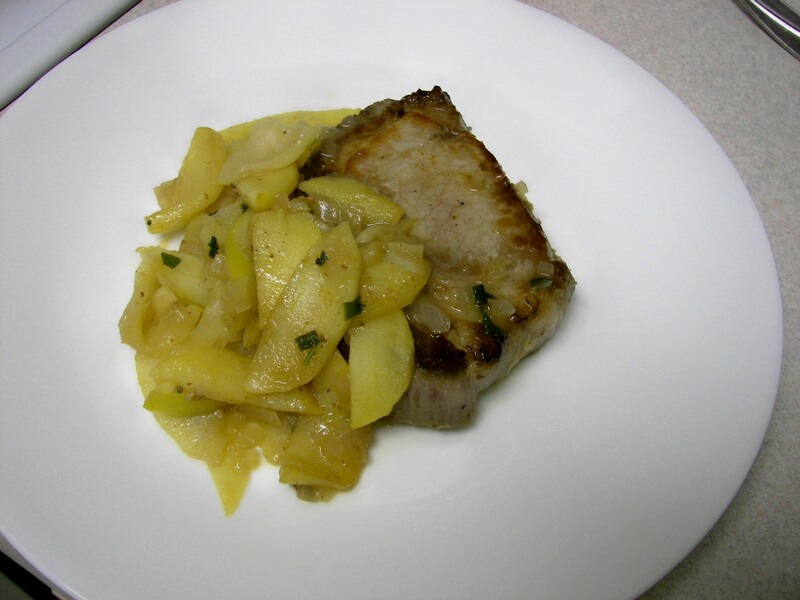 Remove the pork from oven, and arrange apples around pork; reduce heat to 350°, and cook an additional 20 minutes or until pork is done.